Oh yes those would be absolutely huge. 1 million plus units first week easy on each of those. Good movies sell well on disc. Its the crap that just needs to go to the sewer. LOL. I bet if Titanic came out say a week before thanksgiving it would sell at least 3 million first week next year. Yeah I'm surprised Titanic hasn't come out yet. I though for sure it would get released before Star Wars. I agree it'll move a lot of units and I'd be stunned if it didn't come out next year. Finding Nemo will do well of course, but predictable as it's a Pixar title and they always do well. Not sure about Jaws, I know it's a great movie and a cult classic, but I don't think sales will be on par as Finding Nemo or Titanic. Jaws is something I am leary about as High def might expose the flaws in jaws . Titanic in 3D would be awesome. I need to get a 3DTV by next year, hopefully by the time that comes out. Jaw3D would be wild as well (I think about the promo in BTTF 2 about Jaws 17, lol). My thought is that Blu-ray is looking great and will continue to look great at least through POTC, and possibly even up to when HP is released on 11/11. But then the BD wad has pretty much been shot for the rest of the year. After that the comparisons are going to be much tougher and that will be reflected in YoY growth trends. OD still down 2.37% despite a box office power improvement of 47% over last year. 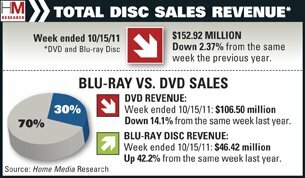 Blu-ray is up 42% though, but it loses significant in light of the better titles compared to last year. I'll update the table later this evening. Hey bruce, can you compare thenumbers with HMM. I noticed that thenumbers had bluray top 10 over $100 million for the week ending 10/15 I think. Seems awefully high. Maybe it was the week before I am not sure. BTW I think this week with JP and some legs for Pirates is gonna be HUGE. I can't help but notice that BD growth is lagging release strength growth, even while it continues to cannibalize from DVD. When the impact of the strong catalog releases subside and the relative strength of release shifts post 11/11, will we see flat to negative BD growth? Sure, I'll post a table comparing thenumbers vs. HMM. It's been running really high compared to HMM, and I think it's exceeded it 5 weeks in a row now. In fact, every week when there are some top titles out, thenumbers estimates are higher than HMM, so I look for that tread to continue through the end of the year. Bottom line is that obviously those estimates are either high, or HMM is way low. But since HMM has correlated very well with the DEG the last 4 quarters, that makes it almost certain thenumbers are way too high (and probably always has been). So therefore take them with a huge grain of salt, as they are perhaps 40-50% high from what I can guess. Week 1 Pirates HMM will be out next week so that should be one of the top weeks of the year for Blu-ray. I would think over 100 million and anything less is a huge disappointment, because DVD isn't selling POTC4 until next month. It's really hard to say. Blu-ray has been responding well to strong YoY BO comparison, as a growing format obviously should. It hasn't done that well this year, when it's been flat or in declining BO power, as was the case in the first 6 months. For example, in Q2 BO was down less than 5% but BLu-ray's growth was still under 10%. In Q3 sales were up 50%, while box office was up 12.2%. Q4 BO is way up so far and of course so is Blu-ray. It'll be interesting to see what the BO YoY is in the 2nd half of the quarter and how Blu-ray and OD respond. I'm more interested in optical disc performance as a whole, because one needs to see how Blu-ray's gains are affecting OD. For example, if DVD sales are plummeting twice as fast as Blu-ray is growing, and under flat YoY box office conditions (which by the end of the year, the TBO should be almost even with 2010 or slightly under), then that means that Blu-ray is catching only a fraction of DVD's attrition. The ideal scenario is Blu-ray outgrowing DVD's attrition, but that may not be realistic in this day and age. Should be interesting to watch and see how digital picks up some of the slack. Hopefully soon I can track OD vs. Digital sales and get a marketshare of digital vs. OD. I acquired UltraViolet copies of Horrible Bosses and Green Lantern (plus the add-in animated movie) for right around $3 each. I can't imagine that is what the studios had in mind, but as long as they want to package it with each disc my guess is there will be individuals and rentailers who will be looking to make a few bucks by emailing out codes. Oh yeah. I believe it goes way over $100 million. No dvd to buy and no rental. Here's the updated sales table.